Hope you had a great October! It has not been an easy one as lots of movement in the planet. What do I mean? I mean let go and get rid of everything that no longer serves you in your life and on your journey!! 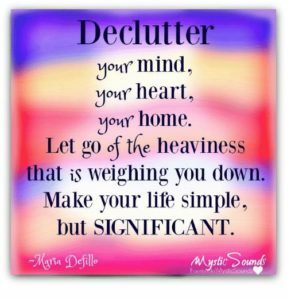 So when I say Declutter I mean our homes, our surroundings, the people in our lives, the beliefs, the thoughts and the energies. If you need support with the beliefs and thoughts and how to start you can always contact me. So what happened in October! I started the Mo & Jo Chakra Show with Joanna Mc Donald. So much fun! You can watch it here, or on Facebook every Tuesday and on You tube. The page is Mo & Jo Chakra Show on Facebook. Interviews with people inspiring me and doing great work. Videos, coaching and so much more. 24 November the Babyshow. I am event organizer. 25 tables and 4 guest speakers. Yoga and Zumba class for kids. I keep jumping and following my curiosity and enjoying the ride. Hope you are too. Wishing you a great November!